Linsey Cole is the Associate Director for Enterprise and Entrepreneurship at London South Bank University (LSBU). She is responsible for enterprise and entrepreneurship education and business incubation, managing a coherent service for students, staff and commercial tenants. She leads on the development of new incubation spaces on LSBU’s campus and beyond, to grow income and reputation in this area. Linsey has developed the university's award-winning approach to enterprise and entrepreneurship education, to support LSBU students and alumni to develop enterprise skills and start and grow their own businesses. Her team deliver a programme of extra-curricular enterprise support from LSBU's Clarence Centre for Enterprise and Innovation, including events, start-up programmes and competitions. She also supports staff across LSBU to embed enterprise in the curriculum, building students' enterprise skills and ambitions. Linsey works with a network of external partners and other universities to support LSBU to deliver an innovative programme of enterprise support. Prior to her work at LSBU, Linsey was the Head of Business Partnerships at the University of East London, working with a network of local, national and international partners to generate income for the university and support the regeneration of East London. She has a particular interest in women's entrepreneurship and enterprise policy and completed a secondment at the UK government Department of Business, Innovation and Skills in 2012. 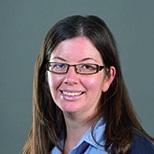 Linsey is a Senior Fellow of the Higher Education Academy (SFHEA).